Hermit crabs and sea anemones share an unusual and intimate underwater relationship. Young hermit crabs will often pick up a young sea anemone to attach to their shell and they become partners for life. They even grow at roughly the same rate. When hermit crabs outgrow their shell, they often take the sea anemone with them to the new one. Some sea anemones have gone so far as to cover most of the surface of the hermit crab’s shell so when the crab eventually outgrows the shell, he doesn’t have to move. The relationship of the hermit crab and sea anemone serves both a multitude of purposes. Hermit crabs and sea anemones have a symbiotic relationship, meaning they live in harmony together. It’s a stable connection that sidesteps the typical prey and predator relationship found in nature. The type of symbiosis they engage in is called commensalism. Commensalism means one organism benefits and the other organism isn’t harmed by the partnership. Neither the hermit crab nor the sea anemone is negatively affected by their symbiotic and commensalistic relationship. 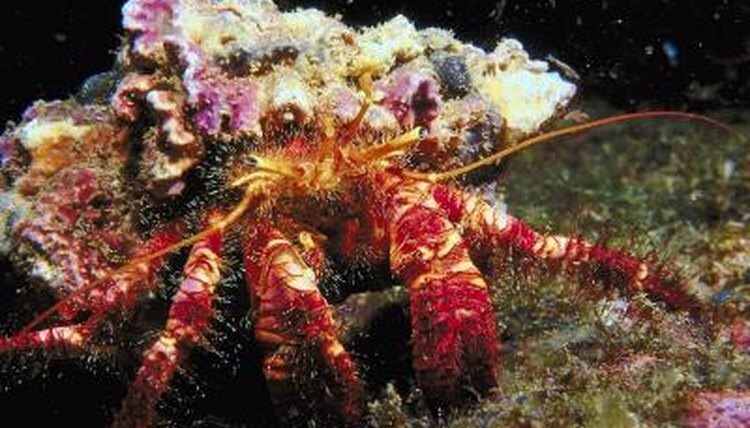 The hermit crab gains protection from predators by its relationship with the sea anemone. Scientists aren’t certain if the hermit crab uses a mechanical or chemical means to communicate a potential threat to the anemone, but the anemone responds to the alert just the same.The sea anemone spreads out long stinging threads over the hermit crab like a bright pink curtain. The anemone also extends its stinging tentacles out as additional protection. A hermit crab is less likely to be eaten by a larger predator fish if he has an anemone onboard. So what does the sea anemone get in return for protecting the hermit crab? Since the sea anemone will eat just about anything in the sea, it gets to eat whatever tidbits the hermit crab leaves behind. The hermit crab does the work of capturing dinner and the sea anemone cleans up the leftovers. It’s a steady food supply for the sea anemone. Sea anemones move very little, if at all. An added benefit of hitching a ride on a hermit crab’s shell is getting exposed to a much larger area to forage for food. While the hermit crab is trolling around on the sea floor, the anemone can make use of the time traveling on his mobile home to trap and collect plankton and small fish.